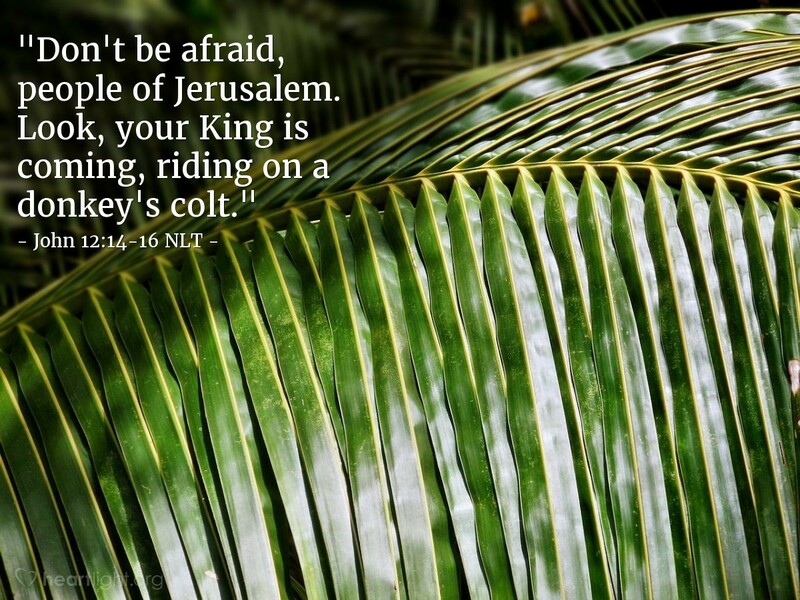 Jesus found a young donkey and rode on it, fulfilling the prophecy that said: "Don't be afraid, people of Jerusalem. Look, your King is coming, riding on a donkey's colt." His disciples didn't understand at the time that this was a fulfillment of prophecy. But after Jesus entered into his glory, they remembered what had happened and realized that these things had been written about him. Jesus must be regarded differently because of his resurrection. If Jesus hadn't been raised from the dead, then our Christian walk has been a sad investment of faith, time, and hope (1 Corinthians 15:17-19). Since Jesus was raised, our lives are full of hope and promise, no matter how we might be threatened physically (1 Corinthians 15:20-26). We have the blessing of knowing how Jesus' story on earth ends — not with a cross and a tomb, but with a resurrected Savior! Once we truly grasp that crucial reality of the resurrection, everything is different; and we are more than conquerors through our peaceful Savior. Father, thank you that Jesus' victory at the cross and the empty tomb redeem me not only from death but also the fear of death! Never let me forget that you are the God who raises the dead and restores life to the lifeless. In Jesus' name. Amen.